When I moved to Bangalore, I wasn’t sure if I wanted a maid working in my house. It was partly out of concern for my privacy, partly driven by desire to not have any dependence whatsoever on another person and partly because I didn’t know whom to ask for a maid! A few weeks into doing my own dishes, dusting and mopping, I realized that household chores can be an excellent workout, besides being a form of meditation. Six years later, I am still mopping the floors of our flat myself. The biggest problem to have plagued my enterprise has been the non-availability of quality mops. Many things can go wrong with a mop. Its head can wear out and start leaving long cotton strands all over the floor or worse, the head can come off the handle because either the head or the handle rusts, causing the connection between them to sever. Over the years I’ve tried practically every brand, model and make available at the shops here, and all of them have met more or less the same fate. Another problem is accessories - almost all the mops sold are supposed to have replacement heads available - but best of luck actually finding one. This Saturday while looking for a new mop, I came across a whole section dedicated to them at Spar. Apparently 3M have figured that this space needs a shakeup and have decided to take a plunge. There they were - Scotch Brite Mops - all nicely packed and neatly stacked. I procured one for a princely sum of Rs. 225 and took it for a spin today. So far, I am impressed. The cotton strands are looped for longevity, the head is neatly screwed onto a sturdy handle and there are strips of some synthetic material with dots of a plasticy polymer on them amidst the thick cotton loops, that are supposed to allow me to scrub stubborn dirt with ease. Today, it all worked as advertised. We’ll see how it holds in the coming days. Considering this is 3M we are dealing with, at least a replacement head should be easy to procure. Will 3M be successful? I have my doubts. Firstly, I know (at least anecdotally) that I am part of tiny minorty that buys mops for their own use. Mopping in most household is delegated to maids - and while we might demand the fastest, newest laptops from our employers at work in the name of productivity and efficiency, a maid at our house isn’t going to get the latest, greatest tool that the money can buy; especially if the tool (as is the case here), happens to be on the expensive side. 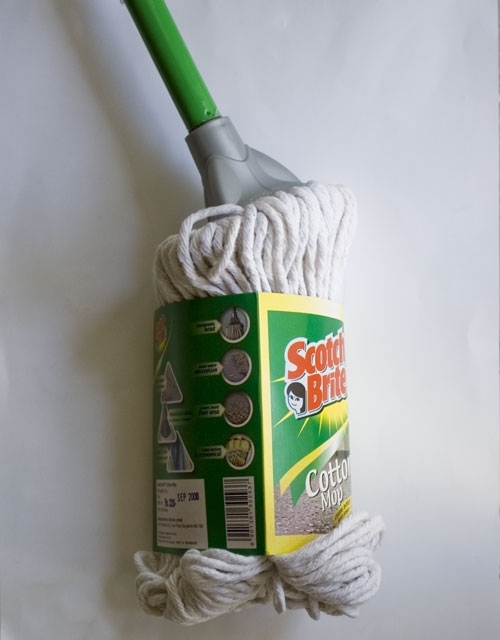 The product might work if commerical establishments start procuring branded mops en masse, but as long as their are cheaper alternatives available, I don’t see that happening either. But who knows - 3M might just be able to muscle shelf space and bulk contracts and put others out of business. As far as mops go, I don’t think that will be such a bad thing.